Hide your .45s boys, looks like the antis have set their sights on big bore pistols. Thread: Hide your .45s boys, looks like the antis have set their sights on big bore pistols. Whowouldathunk the NYT would ever get involved in the 9mm vs. .45 debate...wonders never cease. NativeTexan and pegasus like this. Shows how prolific the debate truly is. That and how far the Times has slipped into the tabloid end of the press. NativeTexan and 230JHP like this. Well, in honor of the esteemed NYT, I practiced with my PT145 today. I still prefer to carry my 9mm, though. I read that with more than a little incredulity but then I remembered that there are darn few journalists that know anything about firearms. I think perhaps the authors were really referencing the ascendance of the "plastic fantastic" pistols during the '80s and '90s. Or maybe they're just completely clueless. Last edited by Joe Reeser; 04-04-2019 at 05:34 PM. jtg452, 230JHP and pegasus like this. If you want the money out of politics take the power out of government. I read that with a more a little incredulity but then I remembered that there are darn few journalists that know anything about firearms. I think perhaps the authors were really referencing the ascendance of the "plastic fantastic" pistols during the '80s and '90s. My bet is the latter rather than the former. Actually I stopped reading to keep my head from exploding from nonsense overload. Then, I figured he made some sense saying we don't need to protect ourselves with big bore guns. Use small bore guns like the .223! I mean he said the .22 wasn't used as much as it used to and the .223 is close enough? It's all BS! And it ain't gonna fly. Not until we have another demo-commie CEO with them also controlling the senate. Just as with the Kommi-fornication mag band. To get into specific changes to our firearms already protected by the 2nd amendment would require an entire rewrite of the 2nd. That according to the lawyers from the larger second amendment rights groups who frequent Tom Gresham's Gun Talk Radio which I try to catch ever Sunday afternoon. 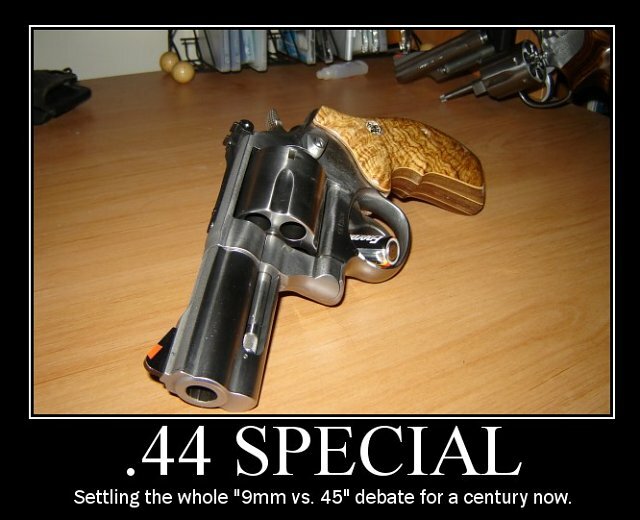 well they (we) really need to bring this decades old debate over 9MM VS 45 to a end. maybe someone should develop say a .400 caliber round, maybe Colt could do it , come out with something totally new and in the middle maybe call it the 40 Colt or sumpfen? I bet it would be a big seller, maybe even law enforcement would get on board with it? It's been done 3 times. Once by Colt, once by Smith and Wesson and another time by IMI. Ever hear of the .41 Long Colt, .41 Mag, or the .41AE? The .41LC got screw up by technology advancing and Colt changing the diameter of the bullet instead of redesigning the cartridge so the bullet still match the nominal bore diameter. Their horrid QC on the barrels didn't help much. The bores are all over the place. Late guns used .38WCF .400 barrels, early ones went from .406 to .412 because it was a low demand and Colt didn't want to replace worn out equipment. A .396 bullet (the final bullet diameter) isn't going to be very accurate in a .409 bore much less something like a .411 or .412. The .41 Mag was too big and heavy (nobody wanted to carry a 4" N-frame on their Sam Browne Belt every day). Then, there's that it's too powerful for the bullet technology of the day to keep it from overpenetrating. The light loads weren't really any better than already established cartridges. The .41AE died when Smith and Wesson's name recognition and LEO connections pushed the .40 S&W to the fore, overshadowing it.